Three totally different cars in a row, that's good challenging fun . Will probably start to create a setup for the Osella now.., never had been very good in creating a set for this one (a bit too less driving feel with this car). For the F2000 I will probably just use my Imola setup and only adjust the wings and ARB + diff. if needed. -race1(vintage replica): Second car in front of me missed to start and I crashed into that standing car. 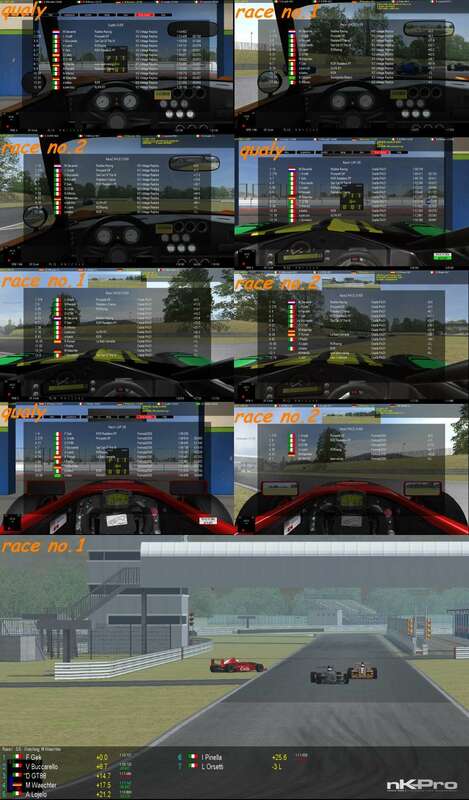 I was coping a bit with gears, 1st gear at the H-shifter (to my right) and 2nd (to 5th gear) at a button at the wheel, so I was not able much to steer away (around the standing car) in the first few meters at the start, before finally getting into 2nd gear. So my race was amost done already at the start, in terms of a better position. -race2(vintage repilca): While being on a drift, I lost the rear on the last turns curb, my mistake . Just lost time and one or maybe at the end two positions. 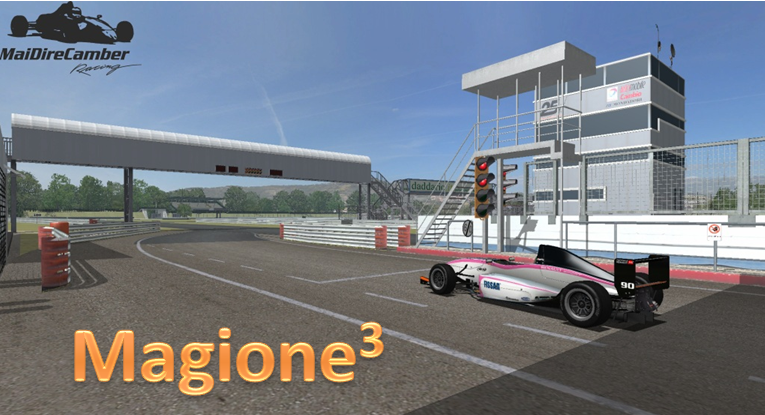 -race1(osella): Got hit by someone at the rear after the long straight, because of missing his brakes a bit. Got stuck there in the gravel unfortunaltely, so ESC->back to pits and drive on from behind. -race2(F2000): Got hit at t2, again because of a driver missing his brakes or else, but that all happened due a little battle, not a big deal. The problem was -after we both turned around beside the track after the collision-, me and the other driver started off again -heading to the track again- at the very same moment, which lead into another collision (each getting stuck again for a moment with the other car). Could drive on, just lost time of course and one position at that little incident. But the rest (which was the majority) of the racing was fine an fun. My qualifyings were ok, just except the one with the Vintage Replica, which I could have done at least three seonds better (1:17.0 instead of my 1:20.1): In the two races I used better ARB settings and could go a bit faster compared to the qualy session finally. Grazie mille per la maratona di gare è stato molto divertente! Mi sono imbucato all'ultimo secondo ma sono riuscito a fare delle gare discrete.Errore mio con la vintage dove ho causato un contatto in una delle due gare per il resto non ho toccato nessuno.Con l'osella sono stato tamponato ambo le gare ma fortunatamente si è dimostrata solida non danneggiandosi molto in ogni caso ero lento anche con la macchina integra,bravo Andrea Lojelo per il sorpasso nell'ultimo metro utile! Con la f2000 due gare regolari (un testacoda nella prima ma non ho perso posizioni) senza contatti con tempi abbastanza costanti anche se non da strapparsi i capelli. Thanks for the great race report, Marco! @Giovanni. uff...quel sorpasso all'ultimo metro e' stato anche un po' oltre il limite da parte mia... ho tenuto il gas aperto anche se ero sull'erba per non toccarti. In qualsiasi caso davvero divertente tutta la serata.